After watching the county’s biggest tax incentives package turn into its biggest economic development bust, Orange County on Tuesday began in-depth deliberations with at least two and possibly more players offering to salvage a heavily-subsidized Lake Nona biomedical research laboratory that is soon to be departed by Sanford Burnham Prebys. On Tuesday the Orange County Commission heard pitches from Florida Hospital and the University of Central Florida as the central players in two proposed deals to take over the Sanford Burnham Medical Discovery Institute at Lake Nona, and then heard a request from a possible third player, Orlando Health, that the county take its time, and openly seek other proposals. One pitch, from Florida Hospital, offered no cash return to the county or the other partners who had invested in the Sanford Burnham deal, while the other, from UCF, offered rent, and reimbursement of some of the money Sanford Burnham still owes the state. The county, along with the city of Orlando, and with the developer of Lake Nona, Tavistock Group, are trying to figure out what to do with the $80 million, state-of-the-art laboratory building constructed at Lake Nona, since Sanford Burnham announced in 2016 that it no longer sees a viable way of succeeding there and intends to walk away. The California-based non-profit pharmaceutical research institute had come to Lake Nona after receiving $40.7 million from Orange County, $32.7 million from Orlando, $155 million from the state, and $17.6 million from Tavistock’s development company for that project, the Lake Nona Land Co.
Any decision on what to do with the state-of-the-art laboratory building the public monies built, and which Sanford Burnham intends to abandon, will have to be from a unanimous agreement among the county, the city of Orlando, and Tavistock, Orange County Mayor Teresa Jacobs said Tuesday. 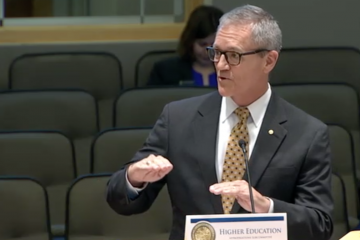 Tuesday at the Orange County Commissioners meeting, UCF appeared to have an early political advantage, though Florida Hospital made a bold pitch for national preeminence, and former Florida Senate President Andy Gardiner, now a vice president with Orlando Health, urged officials to open to other proposals. Jacobs harshly questioned Florida Hospital over having developed at least the beginnings of its proposal in long-term private talks with Sanford Burnham that left the county and other public stakeholders literally locked out. Commissioner Emily Bonilla later said that she already prefers the UCF proposal, and she believes other commissioners do too. The hopes held 12 years ago by state and local officials was for more than just 300 or so high-paying, high-tech jobs the Sanford Burnham projected it would create at Lake Nona, a projection it never came close to achieving. 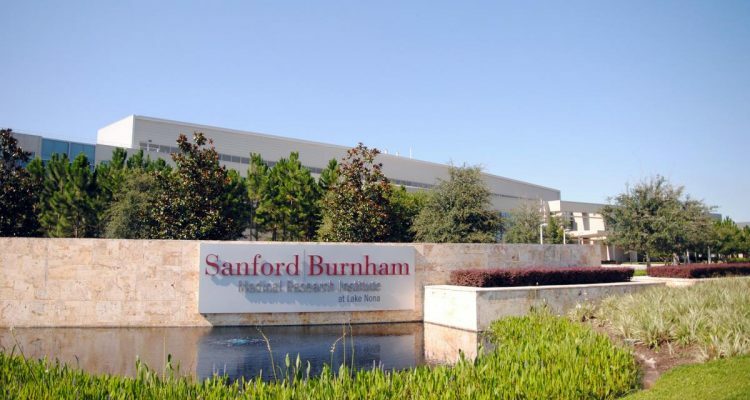 Sanford Burnham once was considered a cornerstone of what is being developed as Orlando’s Lake Nona Medical City complex of hospitals, medical education, and research institutions, which officials hoped would one day rival huge medical center complexes in other cities, notably in places such as Boston and Houston. While hospitals and medical education have come to Lake Nona, the research component – the component expected to generate the big, long-term, private has not really sprouted. The cornerstone institute, Sanford Burnham, withered compared with expectations before the institute announced the Lake Nona closure. “It wasn’t so much about the direct jobs at Burnham, and Burnham wasn’t going to be paying property taxes. What Burnham was going to do was be the magnet and bring in all those pharmaceutical and life-science companies,” said Deputy Orange County Administrator Eric Gassman. The assets may still have considerable longterm value, but Jacobs also talked about having been burned. “I’ll be candid with you: Sanford Burnham, we invested a lot in their success. We took a huge risk for their success and our success. As gracious as I’m trying to be about their failure, it was a colossal failure, from an economic standpoint,” she said. Deborah Robison, Sanford Burnham vice-president of public affairs sent a statement to Florida Politics clarifying the non-profit institute’s position that since 2015 it “has investigated many alternative academic, corporate and clinical strategies, and has been working together with local partners and stakeholders, to identify a solution for the long-term sustainability of biomedical research at the site. That is still our goal. Working with the Moffitt Cancer Center, Florida Hospital, which already has other facilities at Lake Nona and had partnered on research with Sanford Burnham, asked the county and the others to give it the building. In exchange, the hospital company proposed creating a multi-use cancer research and treatment center that would include basic and translational research, precision medicine research, clinical genomics, Phase I clinical research, drug discovery, and a stem-cell laboratory. Florida Hospital projected 205 jobs, with an average salary of $85,000, by the fifth year of operations. 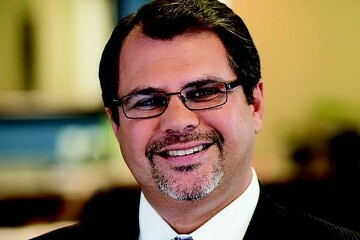 The proposal emphasized that the UF-Moffitt partners know what they’re doing, and have done their homework, have a proposal that is essentially “shovel ready,” and have the credentials and ability to turn the center into a National Cancer Institutes-designated comprehensive cancer center, of which there is currently only one in Florida: the Moffitt Cancer Center in Tampa. “We believe our plan will achieve not in 20 or 25 years but in the very near future a NCI designated cancer center here, in Florida, in Lake Nona,” said Chief Scientific Officer Dr. Steven Smith. 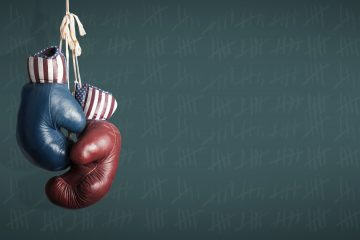 Yet all of that homework had Jacobs and some of the commissioners questioning whether Sanford Burnham and Florida Hospital had been working together for a while on a deal that might not be in the best interest of the county and other public sectors, which already are feeling burned by Sanford Burnham’s deals. Jacobs in particular peppered Florida Hospital officials about a confidential, non-compete agreement. Ultimately, she got Florida Hospital officials to agree to turn over a copy of that agreement to the county before Orange County would consider Florida Hospital’s proposal. The University of Central Florida’s proposal is to team up with Hospital Corporation of America and other companies, also to create a multi-use cancer research and treatment center, this one tied in with UCF’s teaching hospital and medical school at Lake Nona. The UCF partners would pay the county $2 million a year in rent to take over the building, and also promised to pay $11 million the state of Florida says Sanford Burnham owes state taxpayers. Their buildup would be slower than that proposed by Florida Hospital, but bigger, ending after five years with 302 full-time jobs, and some of the partners, notably HCA, would be there on a for-profit basis, paying some taxes. UCF Board Chairman Marcos Marchena said the university also invested in the Sanford Burnham programs, to the tune of $18 million. “This comprehensive cancer center will delver a new level of cancer care to our community, expand biomedical eosins at medical city, and create jobs and increase opportunities for medial research. 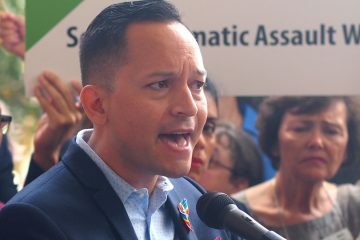 our for-profit partners will also generate revenues for Orange County, both in the form of rent and taxes,” Marchena said. Gardiner, senior vice president of external affairs and community relations at Orlando Health, asked for the county and others to open to other proposals. “I would encourage you, I stand here today with not a specific ask, other than, this should be opened up to every not-for-profit in our community,” Gardiner said.